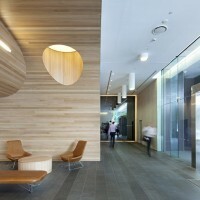 Geyer have designed a lobby area for an office building in Brisbane, Australia. The client wanted to refurbish the existing lobby environment to increase the buildings overall value and increase tenant attraction and retention. 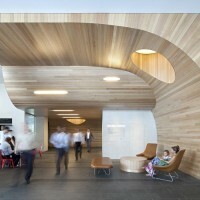 Geyer created a unique and sculptural timber element that both transforms and defines the foyer space. 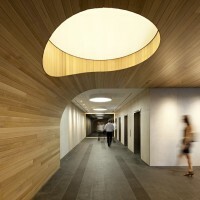 The sculptural timber element was designed to respond to the challenging existing building constraints. Its form ‘unfolds’ through the space to conceal a low-height service corridor in the ceiling, and is heightened towards the entry to announce its presence. 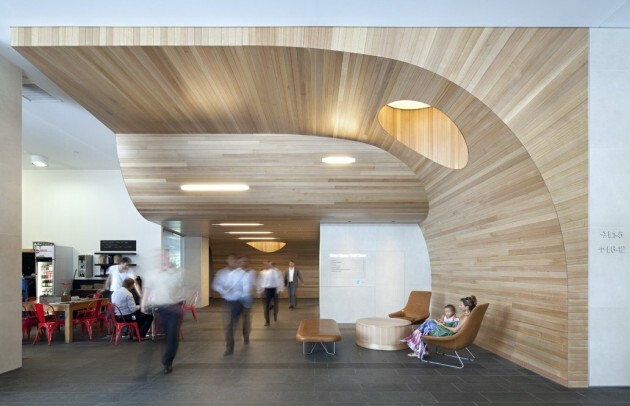 The timber sculpture links the low and high rise lift lobbies which were designed with both monolithic and refined finishes to complement the expressive language of the timber. The lift lobbies incorporate feature materials such as tinted mirror, to reflect, heighten and invigorate the once lifeless space. The materials create a timeless and sophisticated palette, but also to respond to the existing architecture of the building and environmental considerations. Visit the Geyer website – here.